EA7 Emporio Armani Milanowill make its debut in the Euroleague in Istanbul, against the very same team it faced last year but on the opposite court: the Anadolu Efes. The first regular season game will be play out on October 17 and 18. The Turkish team is coming off a semifinal elimination in the league but it reached the Euroleague playoffs forcing game 5 against the eventual champions of Olympiacos Piraeus. 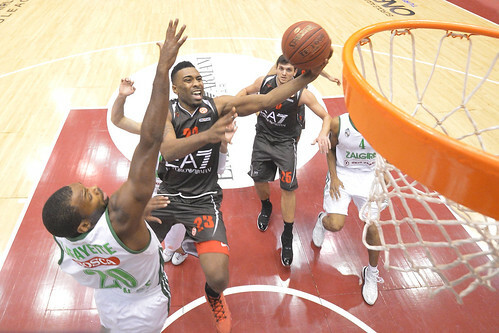 Olimpia will play its first home game on October 24-25 against Zalgiris Kaunas, a team faced also last year (Keith Langford in the picture is shooting in that game) and it’s the only one with Olimpia to have changed the coach in this group. Ilias Zouros returned to Kaunas replacing Joan Plaza, who moved to Malaga. The third game (October 31, November 1) will be played in Madrid against the team that reached the final game last season and won the Liga ACB, Real Madrid which just re-signed Felipe Reyes. The third road game in the first four rounds will take place in Germany, against Bamberg, the team who won the German title and reached the Top 16. The first summer acquisition was Jamar Smith, a shooting guard coming from Israel (Galil Gilboa). The first half is going to finish on November 14-15, when Olimpia will play host to Strasbourg. The French team just signed from Levallois the promising Antoine Diot (24, 1.91).